Who would expect to find a hidden elegant café in the Antwerp train station? Behind the magnificent facade of the old station (built by Leopold II in 1895), facing the tracks go to your extreme left hand corner. Inside the doors of the fancy looking café you will find sandwiches and 5 kinds of croque monsieur (variations on grilled cheese) without fancy prices. 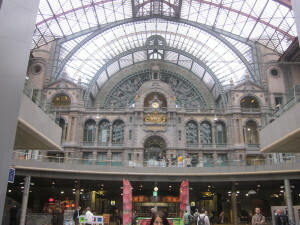 You can buy real diamond jewelry right in the central train station in Antwerp, Belgium. The most important world diamond trade center is just right outside its doors. You are currently browsing the archives for the Flanders category. 55 mySQL queries executed in 0.403 seconds.